Emmet Farrell was one of the most well-known and most highly esteemed figures in Scottish athletics – winner of many Scottish championships and lover of cross-country running, he was in love with the sport from the moment he came into it until running as a senior veteran athlete. For reasons of simplicity I have separated strands of his career and they are covered below. Emmet Farrell was a natural sportsman who had a good career in other sports before he joined Maryhill Harriers and took up running in 1933. Buying a pair of sandshoes for 1/11d he just turned up at the Harriers. He had been a wrestler and a swimmer and in the latter he had won the Mayhill swimming championship, was second in the Western District championship, second in the open sea one mile distance championship behind Willie Burns of Glasgow Police and represented Scotland in the 800 metres and 1500 metres at the Tailteann Games in 1928. He joined Maryhill Harriers at the age of 24 and rapidly progressed as a runner but, according to George Barber in the ‘Scots Athlete’, up to 1937 he was called “the man who always runs second.” . His most notable race of this period was when he was runner-up to Charlie Smith of Dundee Hawkhill Harriers in the National Novice Cross Country Championships of 1933-34. A novice was one who had never won any prize in any cross country race so almost all harriers in the country were eligible. 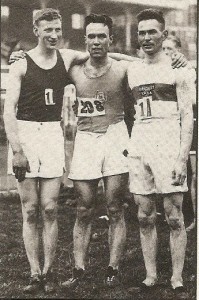 His first individual victory was at Ayr in 1938 when he won the NCCU 10 Miles Championship. That was the start of a series of victories on the track and over the country. In addition to many first class races for his club he ran on the International Cross Country race in 1937, 1938 and 1939. He won the SAAA 6 Miles title in 1938 in 31:02 which was a ‘championship best performance’. Described by George Barber as ‘not his best race but a very exciting one’ was his duel with Willie Sutherland of Shettleston Harriers in the 10 Miles Flat Race at Ibrox in 1939. Neck and neck all the way they passed and re-passed each other all the way and the judges could not separate them and the race was a dead-heat. He was already running in and winning road races. For instance, in 1938 he won the Drymen to Firhill 15 miler and the talk was that he had secret ambitions at the marathon. A fair bit of that is covered on other pages here but I’d like to have a look at the pre-war years – the main source for this is Henry Muchamore’s article in Scotland’s Runner of March 1988. 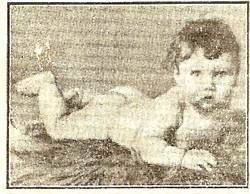 John Emmet Farrell was born in London of Scots parents with, as Henry says, a touch of Irish in his ancestry. he came to Glasgow as an infant and here he has stayed ever since. He went to Glasgow University when it was difficult to gain any University place – the reckoning was that between five and ten percent of the population qualified for it – in 1927 to study English, Modern Languages and Moral Philosophy. Unfortunately his father died and he had to quit the studies to support his mother – no pensions in these days. Henry says: “John Emmet talks feelingly of the great debt he owed his father for giving him the courage to be a sportsman in a very wide sense, as a swimmer, wrestler, boxer and soccer player before he became a runner rather late in life at 24 in 1933. Mention is made above of the Tailteann Games where the major qualification was Irish ancestry and it was his first experience of international competition albeit as a swimmer. He joined Maryhill Harriers at a time when Dunky Wright and Donald Robertson were the kingpins. “Just to be a member was an honour,” he said. He took part in the club pack runs with a pace at the front to dictate how fast the run was to be and no one was allowed to pass or even run on the shoulder of the pace, and a whip – or whipper-in – at the back to make sure the pack kept together. If some were finding the pace too fast, he would communicate with the pace to slow a bit and when the pack approached the end of the run, the whip would tell them when to ‘go for home.’ Most clubs had fast, medium and slow packs and Maryhill was no different with Emmet working his way from the slow pack when he joined right through to the fast pack . He was known early on for being a good runner-up rather than a champion and one columnist is said to have reported on the young Farrell that “he is not likely to make headway at cross-country running.” These reports and comments only spurred him on. His National Championship racing career began with the National Novice Championship in 1934 when he was a very commendable second. The Novice Championship was for athletes who had not won a prize and so the very top men were automatically excluded. It was nevertheless a very prestigious title to win. After the First War, Dunky Wright, then a member of Clydesdale Harriers, maintained that prizes won during the War did not count for entry to post-war novice races! In 1935 he entered for the race but was unplaced and in 1936 he was ninth. It was possible for an athlete to compete in the bigger pool of the National Championships as well as the National Novice and in 1936 Emmett ran well in the big one but just failed to make the team. The following year however he was second to Jimmy Flockhart of Shettleston who went on to the International in Brussels with John Emmet being a very commendable twenty third in his first International. He defeated Flockhart later that year in a Three Miles race at Hampden but was himself beaten into second place by Jack Gifford of Bellahouston. He was however part of the winning team which, Henry tells us, was of three superbly carved runners each on an ebony pedestal. At the end of the year Maryhill were second to Shettleston in the Midland Cross Country Relay with John Emmet getting the fastest time. 1938 was regarded by him as “an unforgettable year.” It was the Maryhill Harriers Diamond Jubilee and he started it by winning the Maryhill Harriers club championship – his third over the seven miles distance. Simultaneously Jim Flockhart was being beaten for his club championship at Shettleston. He trained hard for the National Cross Country Championship to be held over Ayr Racecourse, Emmet contracted a cold three days before the race and is reported to have been on the verge of dropping out. He had a wee sherry in a local Ayr public house beforehand – he was 29 years old and it was his first ever drink of alcohol. As for the race: “After a cautious start, I simply felt so full of running that I was able to step up another gear and win by almost 200 yards. Naturally I was so delighted … other successes can never quite capture that first fine careless rapture.” The added bonus was that Maryhill won the team award for the first time in their history and the caption in the Sunday Mail read: ‘Farrell leads Maryhill to Jubilee Double.’. The picture above shows him being chaired by his team mates after the race and Gordon Porteous, Tommy Harrison and George Barber can all be seen quite clearly. Emmet, who had ten cross country international vests went on to win the National title in 1948 – ten years after the first one. It is worth noting that he was first Scot in 1938 (Belfast – eighth) and 1939 (Cardiff – ninth) which were both great performances and but for the War he might have emulated Jim Flockhart and won the international event. We have already mentioned his first Maryhill Harriers club championship and he went on to win at least eighteen in a row, holding off some very good opposition including a resurgent Dunky Wright immediately after the War. John Emmet admitted that the marathon was not his best event. That was cross-country – “on that surface I seemed to come alive.” He considered his favourite distance to be the nine miles of the Scottish National championship – “a good balance of speed and stamina.” In addition he twice broke the Scottish record for distance run on the track in an hour. When he turned to road racing, he felt better suited to the 15 miles of Drymen to Firhill than the 22 miles of Perth to Dundee (though he did break the record for that distance in 1946) let alone 26 miles 385 yards. He wrote that he took up the marathon “as a challenge and because of its romantic and historical past”, while asserting that he lacked the patience to log up the mileage of a true marathon runner. 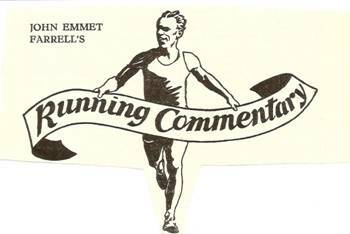 Nevertheless on three or four days a week (30 to 40 miles maximum total) John Emmet Farrell became a good marathon runner, although this part of his career was not as impressive as his shorter distance exploits as a younger man and as an older veteran (in his case M60 to M90). His finest marathon was undoubtedly the AAA Marathon at Loughborough on 23rd August 1947 when he finished fourth in 2:39:46 behind Olympians Jack Holden (2:33), Tom Richards (2:36) and Donald McNab Robertson (2:37). This performance was produced on a ‘hot, sultry day when half the 64 starters retired so that the finishing times were reckoned to be worth at least five or six minutes better.’ Certainly John Emmet was ranked twenty first in the world that year and was nominated as a ‘possible’ for the British Olympic team in 1948. Sadly, despite having his ‘rationing’ diet augmented by occasional food parcels from South Africa, a very disappointed John Emmet was forced to drop out of the Olympic Marathon trial, the Polytechnic event from Windsor to Chiswick on 19th June 1948, due to a very tight leg muscle which eventually, by twenty miles reduced him to a walk. Had he repeated his previous year’s time, he would certainly have participated in the London Olympic Games. In the Scottish Marathon Championships between 1946 and 1954 when he was 45 years old, JEF won three silver and two bronze medals. His second fastest race was 2:40:54 in 1952. He was prevented from winning the event by extremely good marathoners like Donald McNab Robertson, Charlie Robertson and Joe McGhee. Indeed if Joe had been injured after the Scottish and before the Empire Games in Vancouver 1954, John Emmet would have had to face the notorious heatwave marathon as Scotland’s representative. He confessed that he was glad Joe had remained healthy! In 1962, JEF asked that other old campaigner Gordon Porteous, his Maryhill Harrier clubmate, who was four years younger to prepare for another crack at the Scottish Marathon Championship. Consequently they trained together doing 40 or 50 miles per week, although Gordon suspected Farrell of ‘doing and extra run on the QT.’ In the race itself, John Emmet relied on Gordon to prevent him going off course and then with 50 yards to go, as Gordon wrote, “the old b****** sprinted to hold me off at the line! I never let him beat me in a marathon after that,’ Indeed, once John Emmet started competing in World Veterans Championships in the 1970’s, his preferred distances ranged from 1500m to 10000m since he was sensible enough to acknowledge that his marathon days were behind him. Emmet was unfortunate that what would have been his best years were excised from the sport by the second great war from 1939 – 45. I myself believe that it deprived him of any appearance in a major international Games. He would almost certainly have followed Dunky Wright and Donald Robertson into the Olympic Games. His own coverage of his last shot at a major championship appeared in’The Scots Athlete’ and is reproduced below. “Although the AAA’s Championships on July 2nd and 3rd may be regarded as the main test for selection there is the triangular contest at Fallowfield (Manchester) a fortnight later to settle any issues. On the other hand the marathon men have only one ‘bite at the cherry’. In such an arduous event it is impossible to race often. The selectors have done the correct thing in combining the Polytechnic and AAA Marathon events in one. Formerly in Olympic year the selectors chose the respective winners of the ‘Poly’ and AAA Marathons and voted the third man from the second man in these events. The times of the second men were not always a fair indication of the respective merits. Different trails, different weather conditions were a vital factor. But when all compete in the one race the conditions are the same for all. The answer to his last question came in the next issue of the magazine. “The British and Polytechnic Marathon and Olympic Trial was won by the favourite Jack Holden of Tipton in 2 hrs 36 mins44.6 secs with Tom Richards a good second 400 yards behind in 2 hts 38 mins 3 secs. Surprise of the race was the performance of S Jones of the promoting club in finishing third in 2 hrs 40 mins 49 secs just holding off the last minute bid by JA Henning who started slowly but finished very fast. Bert Hemsley of Gosforth and Freshwater (Poly) gave sound performances to finish respectively fifth and sixth. Scottish hope, Charlie Robertson, set the initial pace for the first two miles and was running easily and confidently. Holden was back a bit at this stage but when the field settled at five miles there was a group of eight or nine runners together including Robertson, Holden, Richards, Jones and Griffiths. At 10 and 15 miles the order was still unchanged with Ballard and myself lying handy 40 yards away. At 20 miles Robertson still had a narrow lead but shortly afterwards Holden took the initiative with Robertson second and Richards third. At 22 miles Richards overtook Robertson and at 23 miles the latter was forced to retire. Jones was now third but Henning came away strngly over the last few miles from eighth position to within ten seconds of Jones at the finish. He undoubtedly misjudged his race erring on the side of caution in contra-distinction to Robertson who may have been a little impetuous. It is easy to be wise after the event however but there is speculation as to what the latter may have done had he taken an easier start. He undoubtedly went out to win the race and it is impossible not to admire his spirit. Although he assured me that he was running within himself, 26 miles is a hard task master. He has demonstrated outstanding ability. Experience may do the rest. Charlie can console himself with the thought that his chance may come again. With myself it is different. This is my swan song, I have shed my silk, I was terribly disappointed. Never have I trained more conscientiously. Never did I feel fitter. yet at 5 miles when running easily a muscle in my right leg tightened up. For 15 miles I trailed the leg and tried to nurse it but at 20 miles I had to slow down to less than a walk. For the first time in my running career and in my most important race I failed to finish the course. It is the luck of the game. C Ballard (Surrey,) another favourite, has the misfortune to injure a shoulder during the week and also failed to finish. Henning whose misfortune has been noted could not get going at the start. He felt sluggish and thought it was caused by a week’s rest before the race. It was pleasing to enthusiasts to see Tom Richards take second place. He ran steadily throughout and in so doing was overcoming indisposition. Considering the fast course and good conditions, I was somewhat disappointed with the times The heavy showers came on too late to materially affect the leading runners. Could it be that the course was a little longer than usual? Holden won in fluent style, yet he seemed tired after his effort and assured me that Robertson worried him for a bit. His chances in the Olympics depend on what he has in hand. But something better will be demanded of Jack in the bigger event. Despite his long career Holden has the knack of rising to the occasion however and he has a most economical style. I still think he will be prominent and will give a good account of himself but with many equally classy men in the field, the man with the luck to have a good day may win.